The Royal College of Arms granted the Coat of Arms and Crest in 1973. 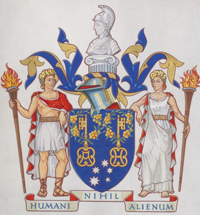 The Arms consist of a shield emblazoned with two keys, as symbols of knowledge, within which are incorporated the letters ‘A’ and ‘H’, and feature the wattle motif and the stars of the Southern Cross. The Crest features a Grecian maiden and a youth wearing belts composed of the letters A and H; both wear wreaths of wattle blossom and support torches which symbolise the passing on of the torch of life. At the top of the armorial shield is an Ionic column supporting the bust of Pallas Athene. 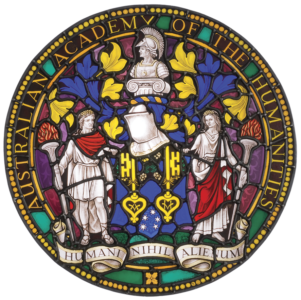 The motto is from Terence’s Heutontimoroumenos (‘The Self Tormenter’) – humani nihil a me alienum puto. In essence, this means, ‘I have an interest in all things concerning humanity’ (literally, ‘I think that there is nothing of humanity separate from me’). The Roundel combines the Crest and Coat of Arms and is used as the Academy logo. A stained glass roundel adaption of the Academy’s Coat of Arms and Crest by B.E.E. Barber, London, was commissioned by the late Honorary Fellow, Kenneth Myer FAHA.